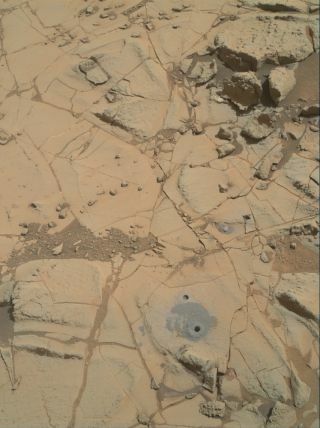 The sample hole created by NASA's Curiosity rover in the Mojave 2 target can be seen in this image. A NASA rover on Mars is getting another taste of an ancient Martian mountain. The space agency's Curiosity Mars rover arrived at Mount Sharp in Gale Crater about five months ago, and since then, the 1-ton robot has successfully drilled two samples from the tall mountain, according to NASA. The second sample, taken from a rock named Mojave 2, appears to be more acidic than the sample taken months earlier from a different rock in the same general area. Both the Confidence Hills and Mojave 2 rocks come from an outcrop named Pahrump Hills. Curiosity managers now think that Mount Sharp — which is about as large as the 14,410 foot-tall (4,392 meters) Mount Rainier in Washington — started off as sediments in a number of lakes that continued to fill and dry on the ancient Red Planet, NASA officials said. "Open questions include whether the more acidic water evident at Mojave 2 was part of environmental conditions when sediments building the mountain were first deposited, or fluid that soaked the site later," NASA officials said in a statement. The Curiosity team initially chose a different rock target (simply called Mojave) to sample in the area, but the rock broke apart when the rover attempted to drill it, ruling out sample collection. Officials then found Mojave 2, which had similar features to the first target rock. "This was our first use of low-percussion drilling on Mars, designed to reduce the energy we impart to the rock," John Michael Morookian, the Curiosity team's surface science and sampling activity lead for the Pahrump Hills campaign, said in the same statement. "Curiosity's drill is essentially a hammer and chisel, and this gives us a way not to hammer as hard." This time, the drill was successful. Now, Curiosity might take another sample or two from Pahrump Hills before moving on up the mountain. Curiosity has been roaming the Red Planet since landing on the Martian surface in 2012. The rover took about two years traveling to Mount Sharp, its ultimate destination in Gale Crater. The SUV-sized rover took many samples throughout its time on the planet.